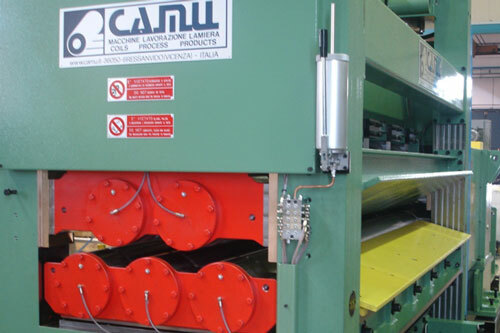 Over time sheet metal has been subject to many evolutions in order to adapt to the increasingly new performance qualitative demands from producers of capital goods. Levelling is an essential stage for modern uses with a high added value. Levelling is a fast and simple process for obtaining flat sheets cut to size and free from internal stresses which at the same time permits high savings and an optimum end-product, thereby eliminating subsequent treatments. Levelling is highly recommended for preventing the well known problems in some coil machining processes such as cutting, profiling, pressing and shearing. Sheets exiting the rolling lines often reveal a series of defects, generally due to widespread phenomena of poor flatness. 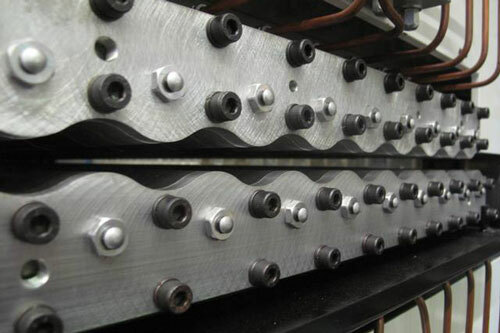 Unlevelled metal sheet creates difficulties for any type of subsequent machining operation because, as it is not even, it can cause problems in various processes downstream that will provoke inevitable slowdowns in production. 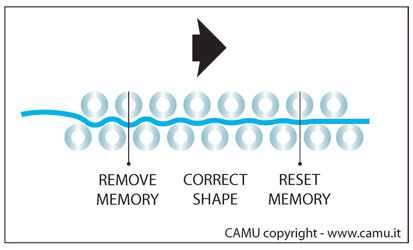 When cutting, the internal stresses in the original material are released and cause visible deformations; the flatness of the material becomes of major importance in order to obtain a high-quality end-product without additional stages that would entail further costs. The leveller is a machine the purpose of which is, by definition, to eliminate the various warps and undulations in the sheets and reduce these effects. 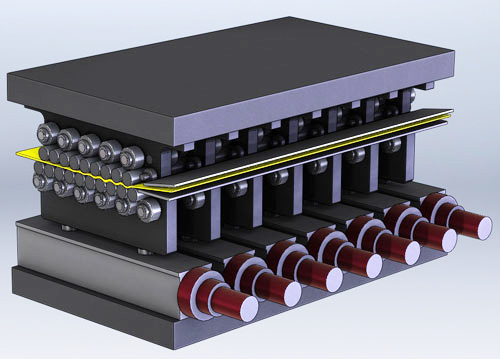 Levellers are multi-cylinder machines that subject the material to “alternate plastic deformations” induced by rollers the diameter and interaxis of which are fundamental in order to obtain a perfect flattening result depending on the thickness and type of material to machine. The work cylinders are motorized by means of a transmission stand that is specifically designed for this type of operation while motion is transmitted by means of particular telescopic extensions which are also specially studied for the transmission of high powers with small diameters. A leveller must have an adequate number of rollers on the basis of the thickness and type of material to work as listed below. Finer materials normally require more levelling rollers than thicker ones. 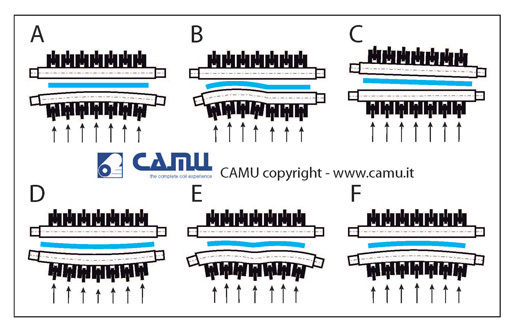 (*the data are exemplificative: the CAMU technical office is available for studying the most suitable solution for specific needs). 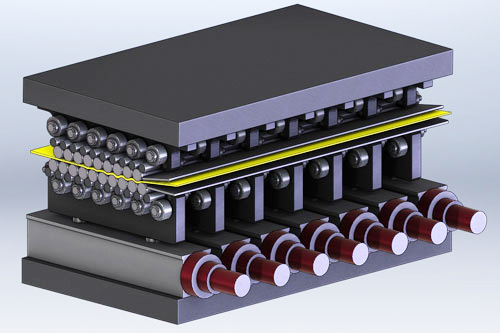 Special back-up rolls fixed on inclined planes that are adjustable by means of NC-controlled electric motors are inserted to counter the flexion of the rollers. 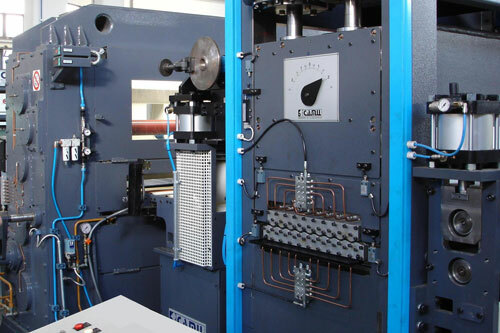 Depending on the defect in the coil, the operator can adjust the rows of back-up rolls in the lower bank so as to counter the deformation of the roller axis, exactly at the point at which it is necessary to remove the defect from the sheet. This operation is facilitated by viewing a graph in the control pulpit. 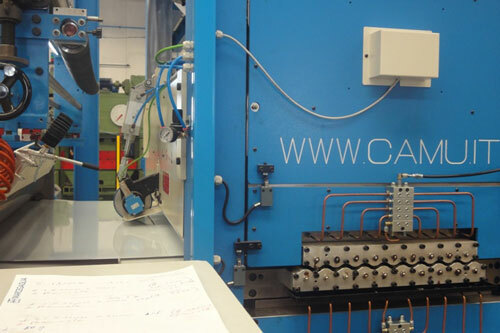 CAMU, in collaboration with Control Techniques – Emerson Group, has designed a special system named EPS (electric pulling system) in order to ensure an unaltered and constant counter-pull which is essential for the levelling stage and for optimizing the machining of high-strength sheets or coils too. The electronic control of levelling makes it possible to store hundreds of programs by means of which it is possible to set various levelling parameters such as thickness, backup-roll position, type of material and coil width, thereby making it easy to repeat orders with recurring supply conditions that can be displayed in graphic form on the main control pulpit.